A couple of years ago, I bit off more than I could chew. I had been offered a spot in a brand-new doctoral program in a nearby city. That was the good news. The bad news was that it would start almost immediately, leaving my wife Colleen and me scrambling to find a place to stay. After a whirlwind tour of the city, we met a landlord that seemed like an all-right sort. He showed us a beautiful apartment right in the heart of downtown and near the campus. After agreeing that it was the place for us, he casually explained that that particular apartment was not actually up for rent - but he was offering a room next door that he was currently renovating to be "just like this one." Once renovation was done, he claimed, there would be no problems - and when we moved in, he would even sit down with us over a celebratory glass of Glenfiddich to toast our arrival. It was a risk, but we decided to give him a month to get the work done. After all, I thought, a guy who treats his tenants to his selection of single-malts can't be all bad. This is life lesson No. 1: A person can have an appreciation for fine scotch and still be a total wad. A month later, we arrived after a long, tiring move to find that none of the work had been done. The place was a disaster. There were cracks in the walls, plaster and sawdust strewn across the floor, snarls of wire jutting from electrical sockets and piles of broken glass lying in the corners. Behind a boarded-up door, we found that a stairwell to the attic had collapsed upon itself, creating a twisted doorway to nowhere and a gaping hole in the roof. This wasn't a fixer-upper so much as a tearer-downer, the kind of place you renovate with a wrecking ball. Meanwhile, we had a rental truck full of boxes and no landlord in sight. With no other options, we moved in on top of the filth, stacking boxes throughout the already-cramped space. After the move, Colleen and I sat among our towering piles of boxes, letting it sink in how badly we had been screwed over. We decided against unpacking much - we knew that we had to get out of there as soon as possible. Tomorrow, we could call a housing inspector and the landlord/tenant board, but until then all we could do was wait. Time crept along as we sat in the dark - cold, tired and bored out of our skulls. I cracked open the corner of one random box and found my DS. Inside was Cooking Mama 2, a cutesy cooking sim in which you prepare meals through a series of culinary mini-games. This was dangerous. There is something about cooking games that always leaves me unsatisfied. I can play most games without a desire to emulate them in real life. After playing Tony Hawk, I'm never seized by a gripping desire to rush out and kickflip to the nearest railing, and I've made it through a decade's worth of Grand Theft Autos without punching a single prostitute. But all cooking games seem to do is make me hungry. Not "I had a big lunch but I guess I could have a salad" hungry. The real deal: full-bore, lip-smacking, "look at your companion and suddenly imagine them as a T-bone steak" hungry. But it was Cooking Mama or nothing. We figured we were in no spot to complain. This is life lesson No. 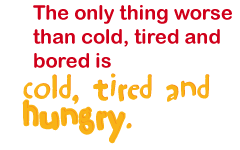 2: The only thing worse than cold, tired and bored is cold, tired and hungry.